An anthology of 423 verses spoken by the Buddha, the Dhammapada serves as the perfect compendium of his teachings for study, reflection, and contemplation. This popular edition from the Buddhist Publication Society transmits the spirit and content as well as the style of the original, skillfully combining clarity and vigor of expression with careful fidelity to the meaning. The inclusion of the Pali text gives students of Pali immediate access to the original. 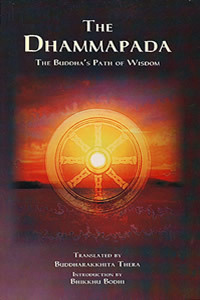 A long introduction by Bhikkhu Bodhi describes the structure of the Dhammapada and shows how the work embodies the essential teachings of the Buddha. It really helps to read some chapter everyday.